The CSA delivered a bunch of purple carrots, I wonder if the darker skin has the same nutrient properties of blueberries? The core is orange and the skin a deep purple. A quick roast and a splash of vinaigrette, side dish completed. 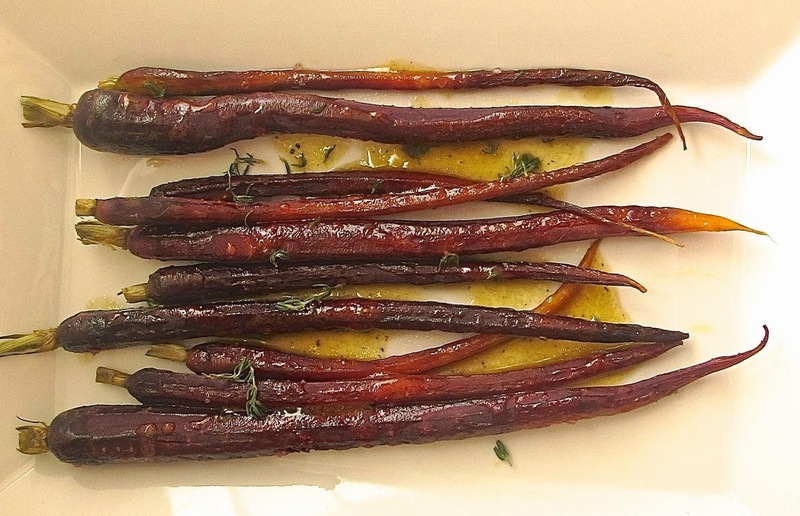 On a baking sheet lined with foil, toss carrots with salt and olive oil, and roast until tender, about 30 minutes. In a small bowl, combine thyme, salt and pepper, vinegar, mustard, and maple syrup. Turn the warm carrots out to a serving dish, drizzle with vinaigrette and sprinkle with additional fresh thyme leaves.